Buy Let Me Ask You A Question from Moot.tv a Coffee. ko-fi.com/lmayaqpod - Ko-fi ❤️ Where creators get paid by fans, with a 'Buy Me a Coffee' button. 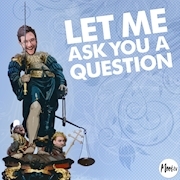 Let Me Ask You A Question is a weekly podcast where host Anthony poses various inquiries and sometimes entertains you…sometimes. Joined by Moot.tv regulars Producer EJ and the Gregaman, Anthony asks “would you rather” style questions to push ideas to the limit and create hilarity along the way. Secured Payments. Support goes to Let Me Ask You A Question from Moot.tv's account. Upgrade Let Me Ask You A Question from Moot.tv to a yearly Gold Membership with a one-time payment.